Consisting of about 1000 species globally, beetles of the family Passalidae feed on decomposing wood in tropical and subtropical forests throughout the world. Passalids live in subsocial family groups within their galleries, characterized by overlapping generations, cooperative brood care, and a complex communication system involving stridulations. In what has been referred to as an “external rumen,” larval passalids feed on the microbe-rich frass and finely chewed wood paste produced by the wood-feeding adults. Endosymbionts found within the guts of passalids include a variety of microbes, including nitrogen-fixing prokaryotes and yeasts that aid in the digestion of wood. 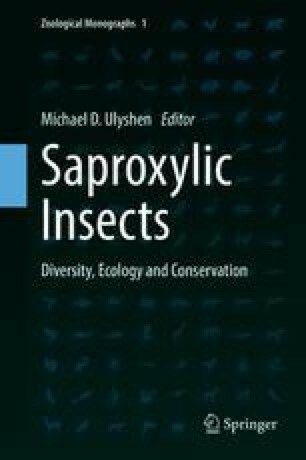 In addition to wood consumption, passalids fragment large amounts of wood in the process of creating extensive tunnel systems and are, among saproxylic insects, perhaps rivaled only by termites in their importance to wood decomposition. Although a number of laboratory studies have measured the amount of wood processed by various passalid species, no attempt has been made to quantify their contributions to wood decomposition under natural conditions. Passalids , along with their many microbial and invertebrate associates, are of considerable conservation concern given high levels of endemism and flightlessness. Many species appear sensitive to forest loss and disturbance and they have been used as indicator taxa in the creation of protected natural areas. I thank Meredith Blackwell for commenting on the manuscript and Jessica Mou for providing edits.